As I dig deeper and deeper into the Google Analytics realm I’m learning a whole lot more about traffic patterns, goal funnels, and conversion tracking, than I ever thought possible. I’m also starting to find, and take advantage of, some great tools that Analytics has to offer (that is, tools that aren’t easily accessible in the standard Google Analytics tutorial). One of these is the utm_nooverride string. When tracking conversions, Google Analytics will report the most recent non-direct source as the source of the conversion. For example, say you search for “skydiving in Virginia.” You click on an ad for “1800Skyride.com” and browse the web site. You're not ready to pull the trigger and book your skydiving adventure just yet. After thinking it over, you go back to the site via the brand keyword “1800 Skyride” and complete the conversion. In Google Analytics, the conversion will be attributed to the second keyword, NOT the original one. 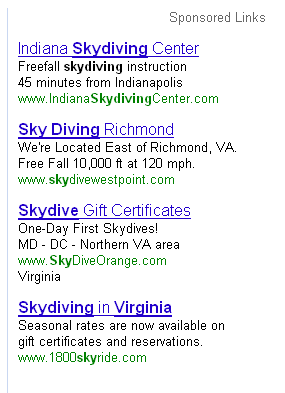 What if, however, you want to attribute the conversion to the original keyword, “skydiving in virginia”? That’s where the utm_nooverride comes in handy. All you have to do is attach the string “utm_nooverride=1” to your brand keyword ads (not all your ads!). Now if someone visits your site via a non-branded keyword first and then visits the site again via a branded keyword, and converts, the conversion is attributed to the original keyword. Don’t worry, this doesn’t mean that your branded keywords will never get any love. If the branded keyword is the original source of the conversion then the conversion will go to that keyword. So go on and give your original keywords the credit they deserve!